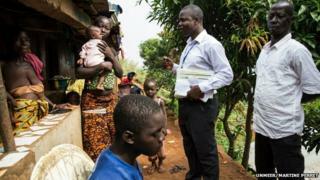 Sierra Leone has begun house-to-house searches in the capital Freetown to find hidden cases of Ebola. President Ernest Bai Koroma said that Sunday trading would be banned and travel between districts restricted. The president said that as Christmas approached, people would need to be reminded that Sierra Leona was at war with a "vicious enemy". Sierra Leone has overtaken Liberia to have the highest number of Ebola cases, World Health Organization figures show. The virus has killed more than 6,800 people this year, mostly in Sierra Leone, Liberia and Guinea. In his statement, President Koroma said the searches aimed to "break the chain of transmission". He added: "Do not hide the sick." The president said that while many districts of the country had made progress in fighting Ebola, challenges still remained in the western part of the country, which for the past two weeks had accounted for 50% of new infections. He said that he was introducing an action plan, Operation Western Area Surge, to encourage people to come forward if they had a fever or other symptoms of Ebola. He said it was necessary to introduce such stringent measures even though it was the festive season - a time when people would normally "celebrate with their families in a joyous manner". In addition to the blanket Sunday trading ban, the new measures would include time restrictions on Saturday and weekday shopping. The prevalence of the virus in the capital Freetown is thought to be one of the reasons why Ebola is spreading so fast in the west. Our correspondent in Sierra Leone, Umaru Fofana, said the measures were partly aimed at controlling crowds. He said people in Freetown continued to gather on the streets or go jogging along the beach despite the Ebola threat. This is not the first time that Sierra Leone has used stringent tactics to locate Ebola sufferers, but none have stopped the rise in infections. US Centers for Disease Control and Prevention head Tom Frieden told the AP news agency that "the fight is going to be long and hard to get to zero cases", and is heavily contingent on sick individuals coming forward to be diagnosed.